So here’s something I would never have thought of on my own but turns out to have been really great. A professor that I work with often was teaching one of the 100-level Writing Seminars that get offered with some regularity. He’d set up the class so that students would have practice doing a variety of kinds of writing (observational, persuasive, etc), and they’d be reading a lot of op ed kinds of things (as well as They Say / I Say by Graff and Birkenstein) along the way to seed discussions and to model their writing on. Pretty typical first year writing seminar fare. He was also working in formal drafts by having papers due and graded, and then having the term’s final paper be a reworking of one of those papers, using it as a glorified draft. And here’s where things got kind of interesting. They didn’t really need me early on in the course. He wasn’t asking for more than could be found on the open web up until the time of the final paper, so having me come early would have been a waste of everyone’s time as they wondered what they were doing with me, I wondered what I was doing with them, and we all promptly forgot about the whole thing. But then by the time they might need me, they’d already written a pretty good version of their papers. So I, of course, started from his Wikipedia page, which always gives us a chance to talk about the uses and misuses of Wikipedia, which leads into a nice discussion of authority and how we determine it, which always ends with us agreeing that finding out who caused something to be put up online has a lot to do with how much weight we give to whatever it is we’re looking at. As we found things, I also started a little mindmap on the chalk board of the kinds of topics Morozov publishes on as well as the related terms/topics that had come up during their discussion. The professor and I both talked a bit about the process of looking critically at your drafts to identify where your reader may need you to give them some evidence before they’ll be willing to follow you along from point A to point B. Evidence is like a bridge that you construct to fill the gap between where your reader is and where you’d like them to be. Furthermore, this process of having a really good draft in hand, reading it critically, and then finding new evidence to fill gaps you didn’t see before is perfectly normal. In fact, it’s great! The research process is circular, so trying to hammer it out flat will often get you less great results. See? It looks like this. You are currently re-examining your topic. Again. And ideally you’ll do it often. At this point we had them pair off, exchange their drafts, and work together to identify places where either hard evidence or other external voices might help them make their papers more effective. Then they reported on their discussions and we all brainstormed together where those kinds of sources might have been published — books? newspapers? scholarly articles? blogs? They were pretty invested in also talking about readability and tone and stuff, which wasn’t really the point of the exercise, but which I pointed out also has an impact on the kinds of sources you might choose. If you’re going for a very coloquial tone, you might not need an analysis of a massive World Bank data set. Maybe you could just find a journalist reporting summary figures. Anyway, from here we went into actual searching. We listed off the major kinds of sources that people said they’d need (predictably it was newspapers, census statistics, articles and books). I told them that the strategies were were going to use to find newspaper articles and to find scholarly articles would also help them find books and more web sources (free text vs indexing searching, but I didn’t say that). We worked from their research guide and we used the Cyberflâneur article’s topic (already somewhat mindmapped and already fully discussed in class) as our example. Taking terms that we’d already seen used in the day’s readings and in Mozorov’s wikipedia article and in our mind map, clumped them into topics, so that we could say “If I’m doing research on social networking, relevant articles may not have used that term but may have talked about the names of specific social networks, like Facebook or Twitter. 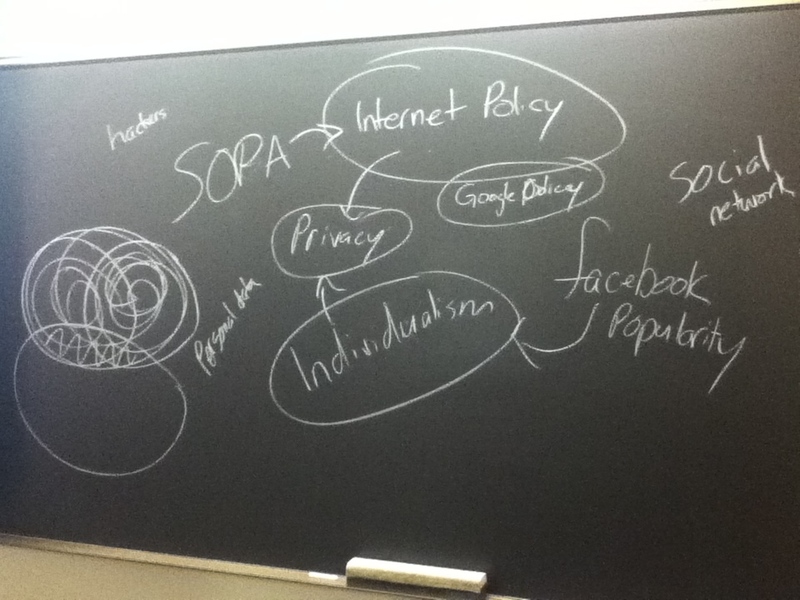 And if I’m talking about individualism in this context, other terms like privacy or performativity or “personal data” might be useful.” (This part of the class is always highly interactive, with them supplying nearly all of the terms and me putting them on the board or into our search boxes.) Then I do my brief venn diagram of Boolean to show how to teach the computer what we mean by “social networks” and “individualism,” and then we do that on the screen. We talk through the weirdness of the computer not understanding words, just matching letters in a row, so our job is to come up with words that would likely appear in a useful article but would likely not appear in all articles. (If this process of using terms in our readings to help us generate searches, yes, this is the Term Economy and Instrumental Reading at work.) Then we look at our results, map the interesting ones, glean the interesting terms, and make another search. The class wraps up with them doing this on their own topics, using the Term Diary to track the useful terms they’re finding, and then reporting back to us some of the more useful/interesting terms they found that they wouldn’t have thought to search on in the first place. And there you have it. My first experiment with teaching for students who had already written their papers. I really have to hand it to the professor for setting things up this way, and for starting us off with a discussion the way he did. He got their participatory juices flowing and I just road that momentum, but it sure made for a fun class session. This is something I do with some regularity and it’s fantastic! We have a somewhat formalized version of an exercise like you discuss here that we walk through after the class has written one paper and just before they begin the next. It gives me the opportunity to discuss the news cycle and how information evolves as well as plenty of chances to discuss the different types of resources, the cyclical nature of both information and the research of it and gives them plenty of hands-on visual work. Thanks for the great post!